Engadget's landed a classic Blurrycam shot of Verizon's internal system showing the prices for a handful of current and upcoming devices. 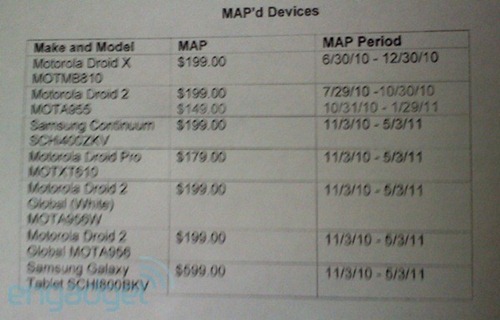 Namely, the Motorola Droid Pro, and the still-unofficial Droid 2 Global and Samsung Continuum. Not unreasonable at all, given that they're all high-end devices. I suppose this should also erase any lingering doubt anyone may have had about the two color choices for the D2 Global - we'll definitely be presented with the standard dark blue, as well as a white model.